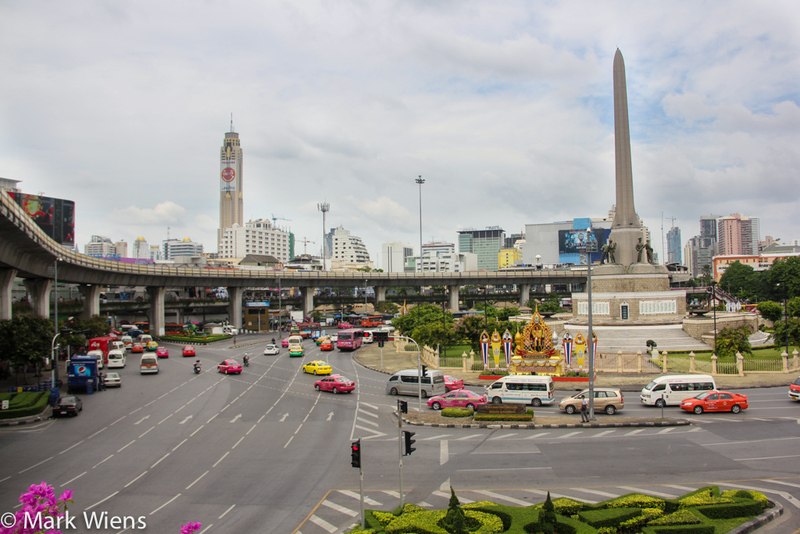 Victory Monument is such a good area for street food because it’s one of Bangkok’s main transportation hubs – countless buses load and unload at this giant roundabout everyday, and it’s also served by the Victory Monument BTS station. Wherever there’s lots of people, there’s always lots of food. There’s a form of natural-selection that takes place in Yaowarat (เยาวราช); The mediocre food is weeded out and ONLY the best street food survives. There’s no denying that Bangkok’s famous Chinatown (video), known in Thai as Yaowarat (เยาวราช), offers some of the most respected street food dining options in all of Bangkok. 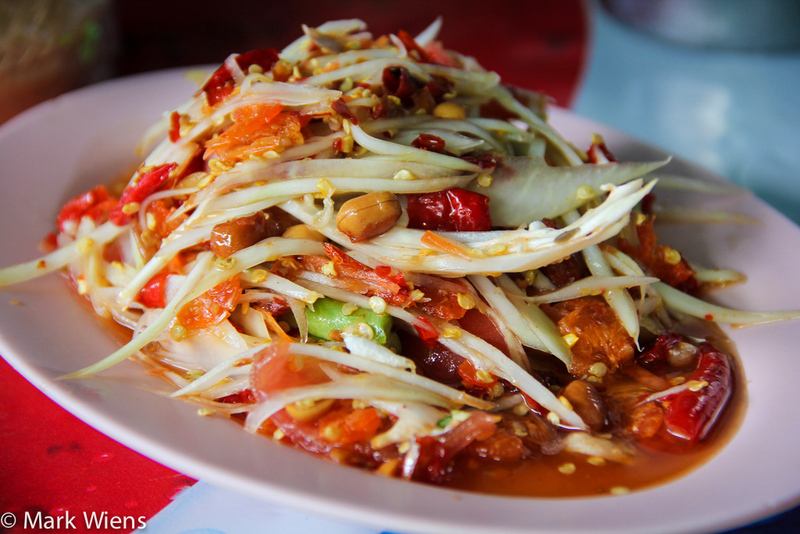 You’ll discover some serious Thai street food masters. Don’t be afraid to explore down a dark side alley or follow the instinct of your nose when you smell something delicious, because Yaowarat is packed with delectable eats and full of food gem surprises. Yaowarat road is the most famous street, cutting through the heart of Chinatown, but on the parallel Charoen Krung road, and down countless small market lanes, you’ll also find endless eating options. A walk down the entirety of Charoen Krung Road is bound to end with a full stomach, as there’s no humanly-possible way (not that I’ve discovered) to resist the tempting delights that are thrown at you from every direction. The smell of stir fried garlic, fragrant noodles, steamed dumplings, roasted duck, and freshly sliced fruit (during season), permeates and saturates the air with a cloud of marvelous Thai street food. Hidden in-between the modern shopping area of Siam and Victory Monument, and hidden in the Phaya Thai neighborhood, is Pectchaburi Soi 5. This soi especially comes alive in the evening, when you’ll find dozens of street food carts and restaurants with their doors open, catering to many people coming home from work. Since it’s a neighborhood, much of the street food in the evening is for takeaway, but there are still some places to sit down and enjoy a meal. Talat Phlu (ตลาดพลู) is an old-school street food garden of Eden in Bangkok that straddles the train track coming from Wang Wian Yai. The area is blessed with high concentration of skilled street food personnel that pride themselves on serving some of the best things to eat in Bangkok. 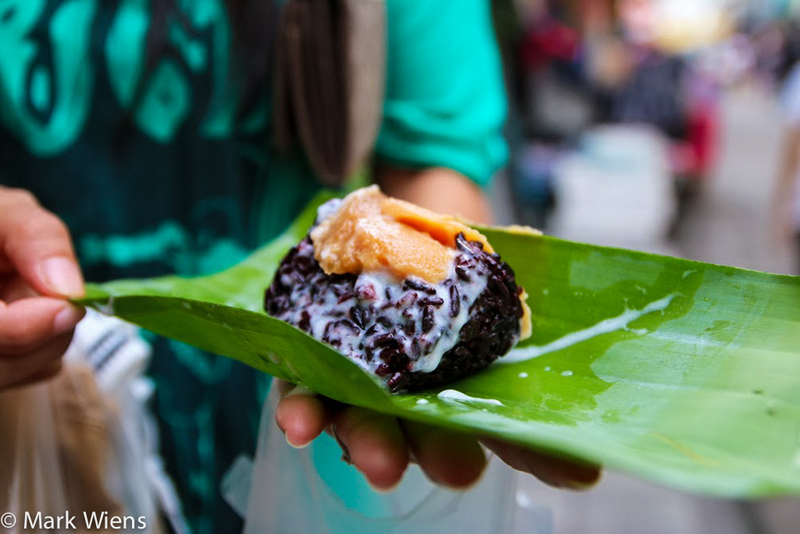 A number of street food stalls have received local Thai awards for their dishes, including an ancient street cart serving a snack (kanom buang yuan ขนมเบื้องญวน) that is so famous it has been decorated with plaques and winning awards that dangle from the pole of the street light. Perpendicular to Victory Monument BTS station is the fashionable street, popular with both locals and expats, known as Rangnam. There are a slew of trendy bars, international restaurants, hotels, massages, some fancier sit down restaurants (like Tida Esarn), and a worthy mass of street food stalls that sprout up especially in the evening time. At the far end of Rangnam (next to Ratchaprarop Rd.) is Kuang Seafood, among my favorite Thai seafood restaurants in Bangkok. Directly opposite Kuang Seafood, just outside the Esso petrol station is a fantastic Isan street food stall that sets up for dinner, and where you can eat just about all thing Isan. Rangnam road also has a rib noodles stall that will have you licking your lips for days. Also, you can also occasionally find Thailand’s notorious dancing shrimp from a vendor in the afternoon. Suk 38 is an oasis, a sanctuary of affordable street food in the midst of Bangkok’s prestigious and expensive Thong Lo (ทองหล่อ) district. Thai street stalls set up in the evening in abundance on both sides of the street, offering a solution to those who prefer open air dining conditions, instead of being cooped up in an air-conditioned overpriced restaurant. Sukhumvit Soi 38 is frequented by tourists and expats, and I wouldn’t say it has the best street food in Bangkok, but it is very convenient, the vendors are friendly, and you’ll find a decent selection of Thai dishes to choose from. Located close to the Chao Phraya river, and near Democracy Monument and Ratchadamnoen, both Tha Pra Chan and Banglamphu are old districts in Bangkok with great eating choices. Some of the most classic and old-school restaurants that look like they’ve been in the food serving business for centuries can be found in this area of town. Just across the Chao Phraya river from Tha Pra Chan (as mentioned above) is a snack lovers Shangri-La, and it happens to be one of my favorite places in all of Bangkok. If you love Thai street food and you’re in Bangkok, it’s a requirement to visit. At Wang Lang Market there is a mind blowing quantity of street snacks and cute things to sample. I often have to need to take a breather in an attempt to analyze what to eat in the most efficient manner to maximize my stomach space. A leisurely stroll through Nang Loeng (นางเลิ้ง) market is both an enjoyable experience and a feasting opportunity for you. The market itself is a throwback in time, along with Ratchawat and Sriyan, it’s one of the few remaining traditional neighborhood markets in Bangkok. The market consists of picturesque ancient wooden buildings and grannies that have made the same home-made snacks and Thai desserts for the entirety of their lives. The Thai recipes of dishes at Nang Loeng are proven. Soi Ari, also referred to as Phahon Yothin Soi 7, is a top-notch dining extravaganza, that although is located in what could be considered main Bangkok, it retains a feeling of being in a suburban neighborhood. Bunches of street food carts in conjunction with trendier sit down diners make Soi Ari yet another Bangkok hot-spot for devouring the best Thai dishes. Soi Ari is adjacent to Ari BTS station, and there’s also fantastic street food at the next BTS station of Saphan Kwai and the surrounding side streets. If you are vegetarian or want to eat healthy and extremely delicious Thai street food in a cafeteria cozy cafeteria sort of setting be sure to check out Baan Suan Pai. Also, be sure to see the useful Vegetarian Thai Food Guide. Outside the gates of Bangkok’s biggest university, Ramkamhaeng, is a sea of Thai street food that has the potential to lure one into a state of food-confusion and happiness. There’s a sizable population of students from the South of Thailand that contributes to a brag-gable selection of Southern Thai restaurants (I’m personally a huge fan of southern Thai food). You can try dishes like kuay teow gaeng (ก๋วยเตี๋ยวแกง) and Thai dishes like khua kling (คั่วกลิ้ง), gaeng taypo (แกงเทโพ), and Southern style gaeng som (). Along with southern food you’ll find dozens of Isan restaurants, and normal general Thai food restaurants where you can order up any type of stir fried Thai dish that your taste are calling for. Silom is the central business district of Bangkok, and the only reason that’s important is because that means a lot of people; and in Thailand that translates into a lot of food! Right at Sala Daeng, in the heart of Silom, there’s a ton of street food, especially during lunchtime when all the office workers come for a bite to eat. On Soi Convent, you’ll find a variety of different Thai dishes to eat, but in my opinion, the food is not always all that great – it’s convenient. About 1 kilometer further south from the main part of Silom, almost in-between Silom and Bangrak is Silom Soi 20, which I think is a great street food street. It’s especially good in the morning, from about 6 am – 9 am when the road is mostly closed to traffic and turns into a fresh market with lots of takeaway food. Centrally located in Bangkok, and surround Chulalongkorn University, Sam Yan market (สามย่าน) and the whole area is a treasure chest spilling over with Thai street food that is waiting to be devoured. The Sam Yan Market, which is both a wet market and sort of student food court, is home to Today Steak, offering cheap Thai street meat and all-things-deep-fried that will require you to use that next notch on your belt (or take it off altogether).